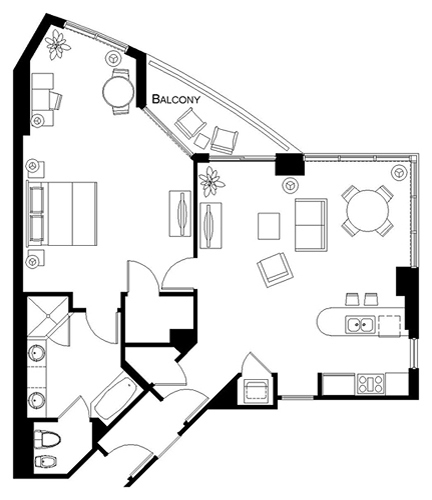 Measuring 1,021 square feet, our One Bedroom Suite offers ample space for an extended Miami getaway. Highlights include a master bedroom with king bed and walk-in closet; master bath with double vanity, glass-enclosed shower and deep-soaking tub; separate open floorplan living/dining room with sleeper sofa, dining table for four, and fully equipped kitchen with stove, double-sized refrigerator, microwave and dishwasher. Guests enjoy sweeping views of the Atlantic Ocean or Intracoastal Waterway from the private furnished balcony.